From Imperial Catalog # 104A. Amethyst and Marigold FLUTE #700 Toothpick. 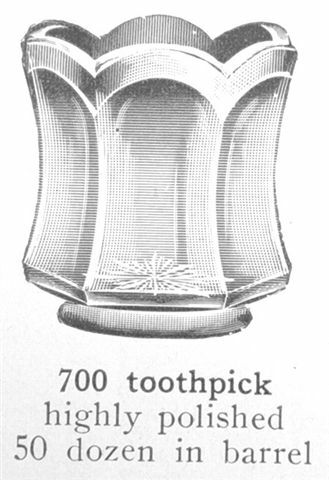 Vaseline and Helios Green FLUTE #700 Toothpick. FLUTE Toothpick: The little toothpick measures 2 1/4” high with a top opening of 2”. It is 3 ¾” across to the outer most points of the handles. 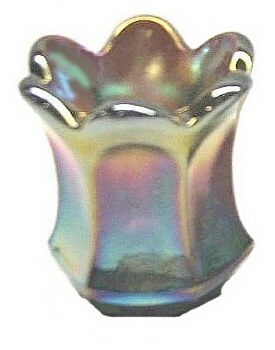 The collar base is 1 ¾” in diameter, having a 14 point star pressed into the underside of the base. The Imperial Iron Cross appears on the inside base. The standard Flute toothpicks have six panels. These are found in marigold, helios green, and purple. Rarely do they turn up in cobalt blue, vaseline, or lime green. How's this for an upset punch set? 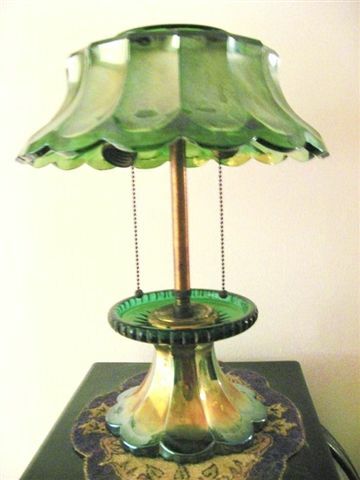 FLUTE lamp: Considering the rarity of these punch sets in any of the colors: marigold, purple, helios, green, emerald; it is rather a shame to see one in such a state of “ill-repute”. Imperial Catalog 104A- Pg. 62A. Imperial FLUTE #700 - Marigold. 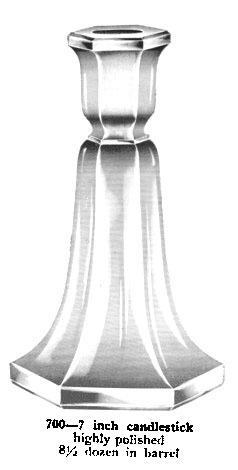 FLUTE Candlesticks: Although these are not listed in Carl O. Burns 1996 Imperial Book, we feel that they were simply over-looked. We believe that these Candlesticks rightfully belong in the Imperial Flute category. They are found in Imperial Catalog 104A, listed as part of the #700 line, just as the other shapes within this #700 listing. Perhaps marigold was the only color produced? This particular style is not seen very often. 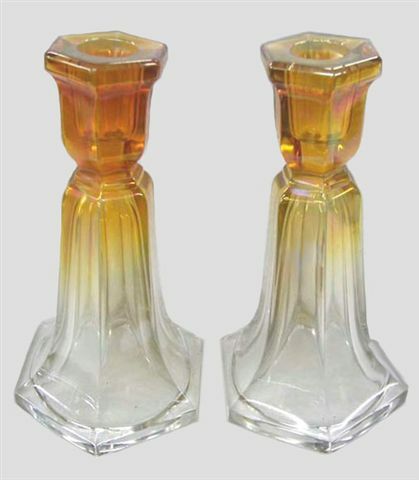 Should any of our viewers have additional information surrounding these candleholders, we would appreciate hearing from you. Left - FLUTE Vt. #1 in Purple. 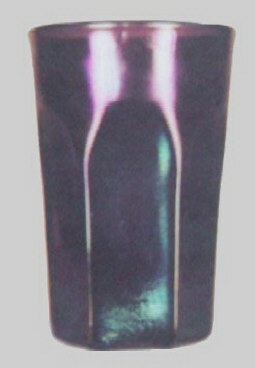 Right - FLUTE Vt. #2 in Purple. Left - FLUTE VT. #3 Tumbler in Blue! - 9 panels, collar base. 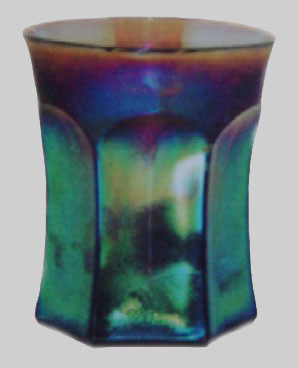 Right - FLUTE VT.#3 Tumbler in Rare Teal color. Courtesy Remmen Auctions. 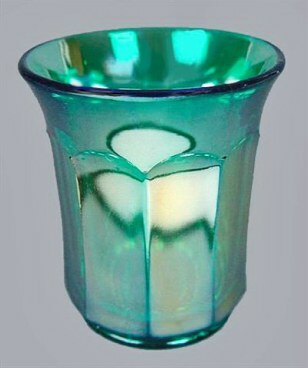 FLUTE Tumblers: Flute #1: contains six panels, has a hexagonal shape and there is no collar base. Top and base are flared. 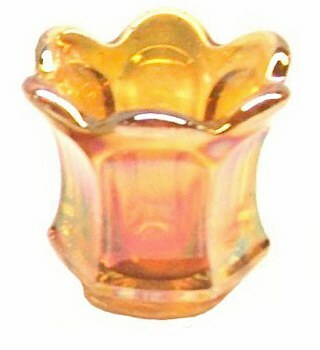 It is known in marigold, and purple, with at least one amber example known. 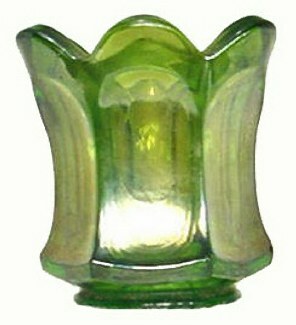 The flare alters measurements somewhat, but generally speaking, it is 3 ¼”- 4 ¼” in height. Flute #2: Has six panels, a hexagonal base, has no collar base. It is much taller than Flute #1, has straight sides and no flare top or bottom. Reported only in purple, and is actually a tankard size tumbler. 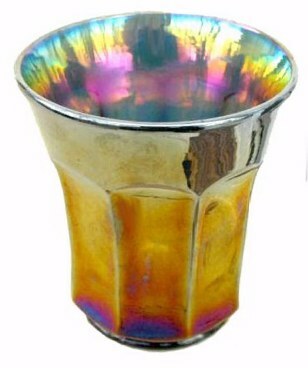 Flute #3: Like the pitcher it was designed to compliment, there are nine Flute panels and this tumbler rests on a collar base. Marigold, purple, helios, and cobalt blue are the standard colors. Rare examples of aqua, smoke and clambroth have also been confirmed. 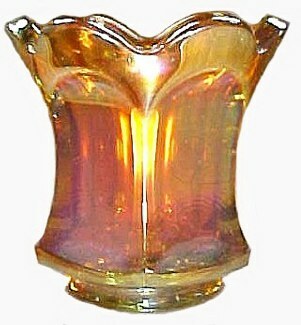 No matching pitchers have surfaced in these three rare colors, but very likely were produced. For true and righteous are His judgments, because He has judged the great harlot who corrupted the earth with her fornication; and He has avenged on her the blood of His servants shed by her”.